Snow White as an action hero—it seems like a crazy notion. Most of us grew up with the Snow White who talks to woodland creatures, and sings catchy tunes about the joys of doing household chores. In director Rupert Sanders’ “Snow White and the Huntsman,” that Snow White is no where to be found. 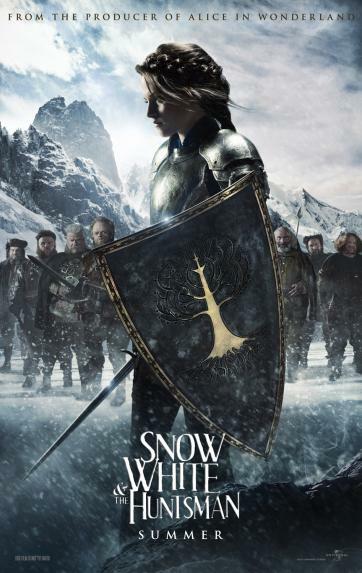 When the evil sorceress Ravenna (Charlize Theron) and her creepy brother (Sam Spruell) invade Snow White’s (Kristen Stewart) father’s kingdom, young Snow is forced to spend most of her childhood locked in a tower. Despite her lack of human contact, she still manages to grow into a kind and beautiful young woman. Unfortunately for her, Queen Ravenna discovers that her power and beauty are fading, and Snow White’s heart is the only cure. Thanks to a rusty nail and some surprising agility, Snow manages to escape. Not one to give up so easily, Ravenna hires the Huntsman (Chris Hemsworth) to find Snow in the Dark Forest. Of course, nothing goes as planned, but in the end good wins. Although, with a few detours from the usual story (don’t worry the dwarves still make an appearance). Truer to the original Brothers Grimm tale “Snow White,” gives the power back to the story’s namesake. As the cautious, but strong Snow White, Kristen Stewart shows that she may just stick around after the “Twilight” series ends. As the Huntsman, Chris Hemsworth continues his summer of blockbusters. While he’s traded in his hammer for an axe, it’s not much of a departure, but he does play the part very well. Of course, the show stealer is Charlize Theron. Ravenna is an complex character, and far more interesting than her vain predicessors. For a modern actress, it’s a fine line to cross, and Ms. Theron does it beautifully. “Snow White and the Huntsman” introduces a new audience to this timeless story. It keeps it classic while adding a modern touch. And reminds us all that not all problems can be solved with a nice long nap.